Unstead Lock lies on the Godalming Navigation at Peasmarsh, between Guildford and Godalming. In 1760 an Act of Parliament was passed so that the Wey navigation could be extended from Guildford to Godalming and this stretch of waterway was opened in 1764. It is now managed by the National Trust. The view is looking towards Guildford with water meadows on the right and the site of the former flour mill - Unstead Mill - to the left behind the camera. 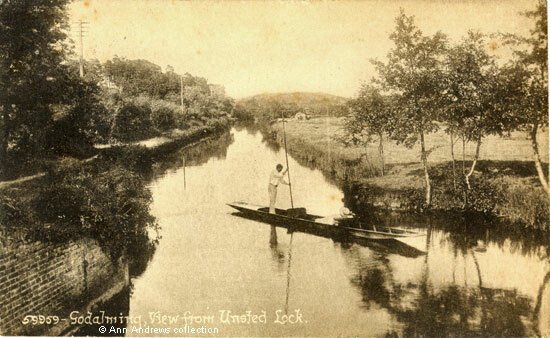 "Godalming, View from Unstead Lock". Published by F. Frith & Co. Ltd., Reigate. No. 59959. This number indicates the original dates from between 1909 and 1910 although this card was posted in 16 Aug 1927 at Godalming and sent to an address in Isleworth. Message not relevant to picture.